1. My first tip as probably the most obvious, but for me, the most helpful is owning a planner. I literally have tonnes of notebooks, each for different things - one to plan my video ideas, one to schedule blog posts, one for school, one for extra-curricular activities, but most importantly, my day-to-day 2017 diary. 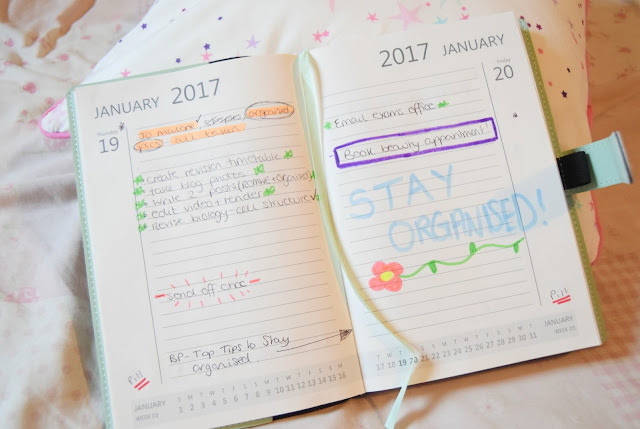 Personally, I love list-making and writing to-do lists so having a small A5 diary with writing space has allowed me to plan what I need to accomplish by the end of the day. However, I would specifically recommend buying an A5 planner as last year mine way A4. Not only is it hefty and not portable, it always led me into over-estimating my ability to finish tasks and I would always end up writing TOO MANY things on a page when there just wasn't enough time in the day. I absolutely hate not completing my to-do list before the end of the night so this always left me in a sour mood before sleeping...NOT GREAT! One thing I love to do is make a colour-coded key - I allows me to see whether a task is finished, if I have an appointment, when I need to take any medication or just to highlight if there is an important thing I need to do. This won't work for everyone but I'm very visual so this 100% works for me! 2. If you don't like list-making or forget to look in your diary on a regular basis, I would definitely opt for some post-it note reminders. These are honestly a god-send if you are forgetful person, like myself, and struggle to remember what you're meant to be doing today. The most important step when writing up your post-its has to be your logical placing of them. Make a mindmap of the things you do the most and where you are the most in your home. It didn't take me long to figure that the most important things were my laptop, phone and food. 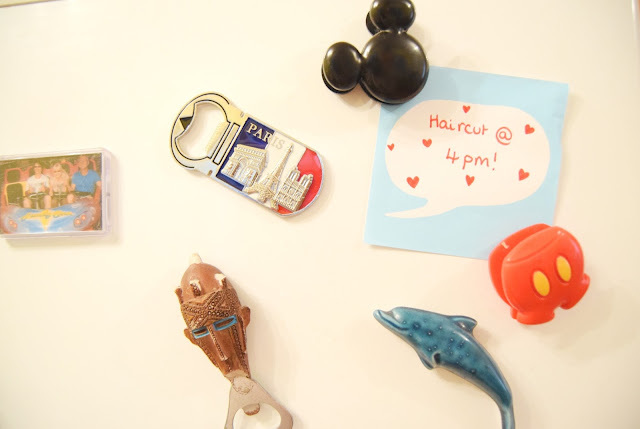 Therefore, I popped a reminder on the fridge as I'm most likely to head there after a long day at school - this is great for appointments! I also slid one inside my laptop as I knew that I use it every evening and finally, I popped one by the side of my phone on my bedside table. 3. 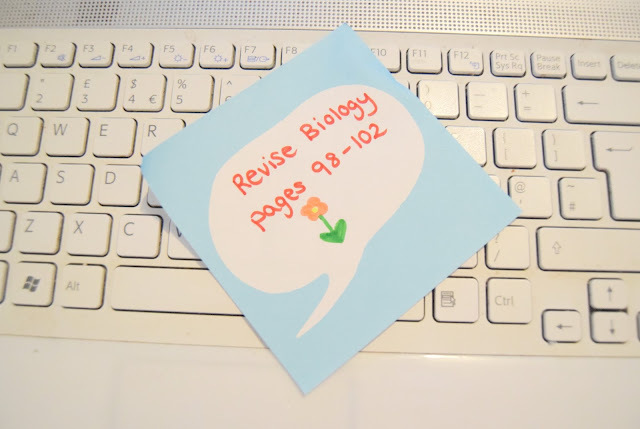 If you are still at school, college or sixth form, studying like me, you may find it helpful to create your own revision timetable. I always love to form my own from scratch because it feels more personal to me and caters for my needs. However, if you don't have the time or want to avoid the hassle, there are a large variety of apps or websites where you can form your own. The main reason I like to make mine personal to me is so I can schedule regular breaks, fit in subjects that I need more work on and find time to slot in activities (BLOGGING) that I'm passionate about...to avoid going absolutely mental during exam season! I created this towards the start of January and it has seriously helped to get me into a steady revision routine ready for my final year of A Levels! 4. Linking in with tip number 3, forming a regular routine is something that has helped my organisation massively. My entire routine was disrupted throughout the Christmas period, leaving me with no sense of time or day. This made me realise how important it is so find a routine and stick with it to ensure my hours weren't being wasted being unproductive. I completely understand that many will disagree with me, as routines can bore people because they feel like they have to stick to strict guidelines. However, routine is something that completely works for me as I'm able to clear my head and have some me-time, as well as being as productive as possible. The largest factors when it comes to routine, for me particularly, is the amount of sleep I'm getting and the time I choose to eat. Being back at school, routine has become much easier for me as I go to bed at a similar time, wake up, have breakfast, have lunch at school and my days repeat in a regular pattern. 5. As I said before, don't over work yourself or overestimate how many hours there are in a day! Make sure you are scheduling in time where you can sit and relax, have a cup of tea or treat yourself to a nice pamper evening. If you don't have regular breaks of treat yourself, you end up turning miserable. From experience, I used to revise for hours every night - this lead to a lack of sleep and insanity. I used to lie in bed thinking about all the work I'd been doing; my brain just wasn't turning off and I would go round in circles. When the heavy bags started to form underneath my eyes and I began falling asleep during school or as soon as I got home, I knew that I needed to change and finally understood the importance of breaks, or social time. 6. Finally, if you're out-and-about, in school or don't own a diary, something I find useful is the notes facility on phones. 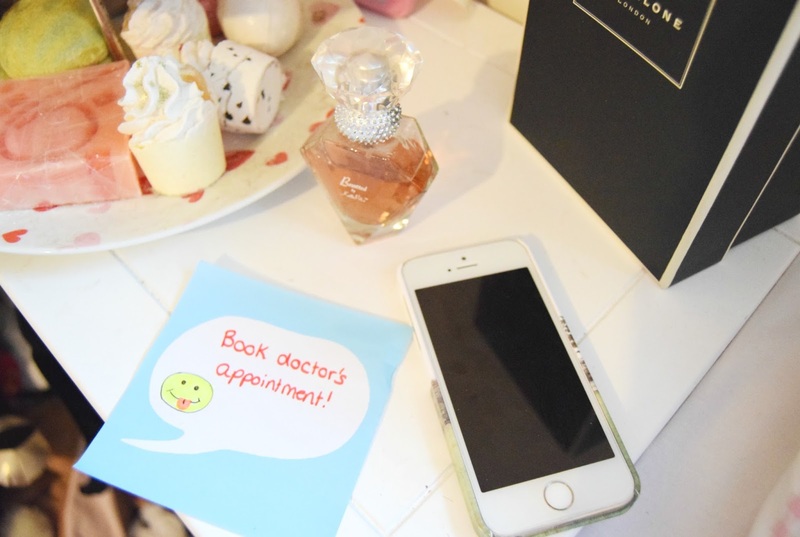 Many phones have access to a notes where you are able to write whatever you want. I literally have so many notes on my phone - I always think of things during the day that I need to do or ideas on presents for someones birthday. This is probably one of my favourite things on my phone and always end up writing a to-do list if I haven't got my diary handy! Make sure to utilise this app because if you don't, you may forget something important you have to do that night. 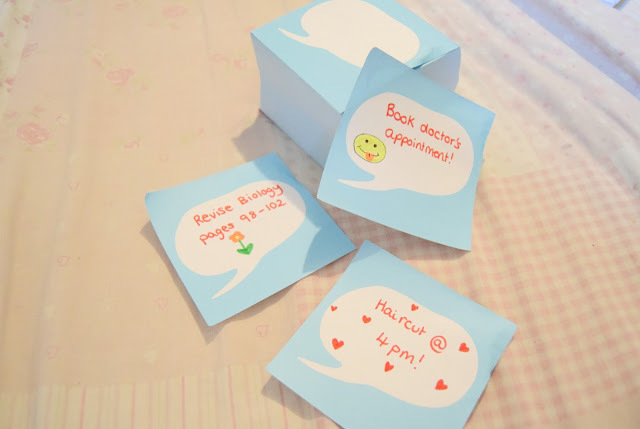 Jot down your thoughts so you can set a reminder for when you are at home. You will thank me, I promise. 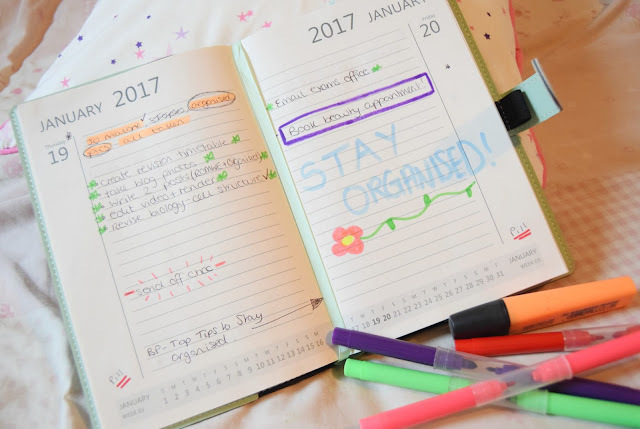 What do you do to stay organised? Are you are crazy routine lady like myself? I am very organised! I have a really cute planner and that's where I write down all my to-do's.